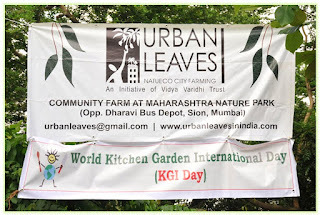 The rain god spared us and a large number of people participated in the World Kitchen Garden Day organized jointly by the Team of Urban Leaves & RUR (R you Recycling) in the verdant surroundings of Maharashtra Nature Park. Over 200 participants came from all over Mumbai, Navi Mumbai & the extended suburbs to know more about Kitchen Gardening, Safe Food and Recycling. A few participants had also taken part in the cooking contest where the recipes had to adhere to the theme of the event, ‘Reviving the lost traditions of Shraavan’. Ms. Preeti Patil explained the idea behind the theme. In India, across most regions and communities, a lot of importance is attached to the Hindu month of Shraavan. It is during this period that the bounty of monsoon makes a variety of leafy green vegetables available for consumption. Many of these vegetables often are not commercially grown and are found growing wild. They are full of vital nutrients and free from pesticides.The focus on shravan greens during the event was an opportunity to understand these veggies, introduce them to the younger urban generation and learn to grow them in our city farms. 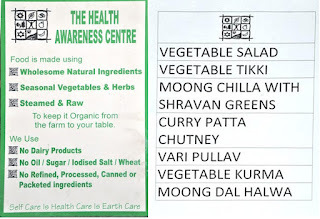 Display of "Variety of Shravan Vegetables". Do you recognise any? Check them out HERE!! 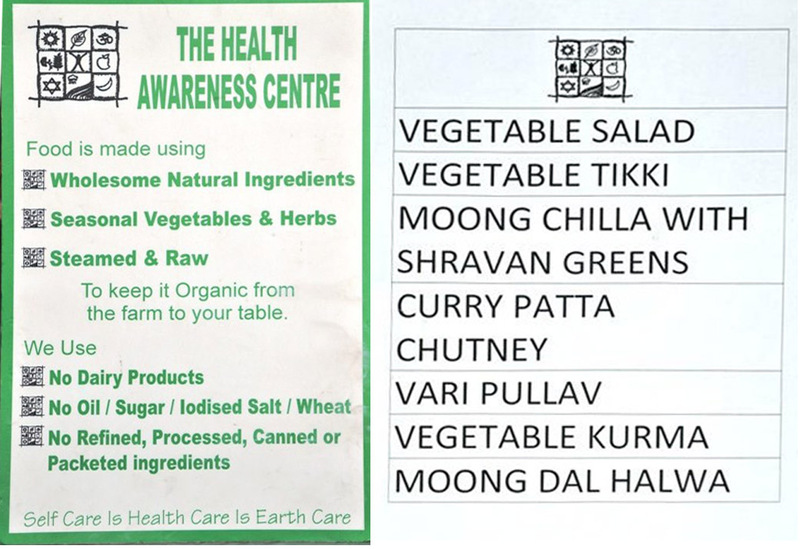 an Organic farmer gave information on uncultivated varieties of Shravan vegetables and special tips on "How to Grow". Vegetables like Shevla, Takla, Bharangi, Shevga, Phodshi are not names that we urbanites are familiar with. Lets get aquintated with names co-inciding with pictures of these vegetables. ﻿spoke about the pesticide residues found in our foods, their toxic effects and how as citizens of India we have a right to organic and safe food. Third Speaker - Monisha Narke from RUR, introduced the concept of Reducing, Reusing and Recycling of things that we use in our daily routine to minimize our ecological footprint. Monisha was quick in requesting a volunteer to carry all the paper cups used during the breakfast to be used for composting at home. Jyoti Despande volunteered! Three cheers for Jyoti!! Earthaholics collated a DIY kit on growing vegetables in container. Urban Leaves team presented a demo on "How to Transplant and Sow Seeds in Container". This kit was on sale for the interested participants to immediately start with Chilly sapling. Judging the Contestents creation was done by Chef Nilesh Limaye and Nutritionist Shilpa Joshi. They also interacted with each of the participant giving them valuable feedback. They commended all the participants for their enthusiasm. Each of the participants introduced themselves and gave the audience some information on their recipes. The judges announced the results. This vegetable grows on uncultivated lands and is available for only a couple of days in the beginning of rainy season. Usually prepared with Prawns, Mrs. Patkar had used Lentils (whole Masoor) in lieu as the rules for the competition required the recipe to be purely Vegetarian. modified a regular GSB recipe 'Tamli' to include another wild 'Shraavan' vegetable called 'Taklaa'. Thus 'Takla chi Tamli' was an innovation to integrate this wild vgetable into a traditional recipe. This vegetable again is availabe from the wild and is available only in the rainy season corresponding to the month of 'Shraavan'. Again, this was an innovative blend of regular recipe of Chikpea flour (Besan) pancakes (Chilla) by integrating the Zumkha into it. These prizes were sponsored by Home Collective India Pvt. Ltd., Girgaum - a store dealing with high quality Kitchen Accessories and other Home Products & Nirmitee Art store, Dadar - a store dealing in Handicrafts. Thereafter, chef Nilesh Limaye and Shilpa Joshi demonstrated a few simple salad recipes. The session was closed by honouring the judges and speakers with potted landscapes that were generously donated by Vriksha Nursery, Irla. The audience was overjoyed to learn about so many connecting facets to an Organic and healthy lifestyle. Special thanks to Dr Vijaya Venkat and Anju for their continuous support in our ventures. 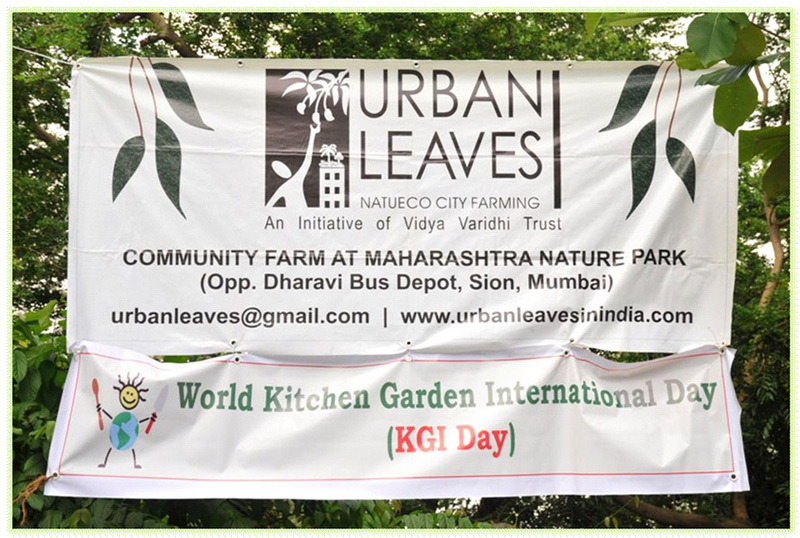 A special touch to the event : Participants appreciated a personal message from Roger Doiron founder of Kitchen Gardeners International www.kgi.org to fellow gardeners in Mumbai on World Kitchen Garden Day.